Bill Ayers wrote a column published on December 5 in The New York Times (where else?). I guess you could read parts of it as an apology of sorts for things he did in the distant past. He also played down his associations with Barack Obama. But what about the more recent past? 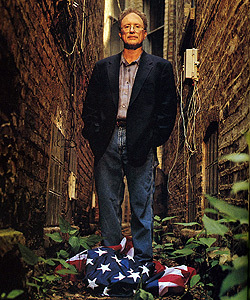 This photo, from a Chicago magazine article in 2001, pretty clearly shows what he thinks of his country and, by extension, most of his fellow citizens. In a notably uncritical interview published in The New York Times (again) on September 11, 2001 he is quoted as saying, “‘I don’t regret setting bombs. I feel we didn’t do enough.” Asked if he would do it all again, he said, “I don’t want to discount the possibility.” Note the irony in the date the interview was published. You can believe what you want about Bill Ayers. Personally, I would have been much happier if he had been writing from a prison cell. And I would be much more comfortable with President-elect Obama if he had been inclined to avoid any kind of association with people like Bill Ayers. I heard Obama’s explanation of his so-called association with Ayers. He served on a committee about urban,community groups to help poor children ,along with a group of other politicians ,including Republicans and that is all .This is his total and complete association with Ayers.You must be listening to Rush Limbaugh and other propagandist against all Democrats,who will use any and all garbage that they can imbelish. I listen to them ,too,to laugh and gripe about them,but not to believe their rubbish.